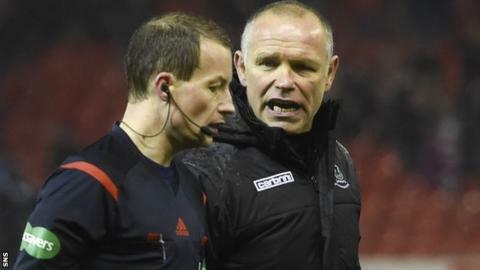 Aberdeen manager Derek McInnes reckons more mistakes by controversial referee Willie Collum cost his team the chance to go above league leaders Celtic. McInnes believes Collum got it wrong when awarding Inverness a penalty that allowed them to go 2-0 ahead. Counterpart John Hughes was equally adamant Adam Rooney should not have had the chance to level from the spot. "We lose a penalty kick at the start of the second half and it's not a penalty for me," said McInnes after their draw. "The boy has jumped into Paul Quinn and Paul hasn't done anything. "He's not tried to impede him, so for me it is a really soft penalty. For me, the referee hasn't got a clear view of it because of Ryan Jack's position. "The linesman should help him there. I'm not exactly sure who gave it, so it makes the task more difficult and, at 2-0 down, it looks like it's going to go against us. "There's no huge blame attached to the officials. It's just some times things go for you and sometimes they don't." However, after a goal from Niall McGinn and that Rooney penalty, the Dons fought back for a draw that takes them level with Celtic, although the reigning champions have two games in hand. "My players never gave it up and they deserve a lot of credit for that," McInnes told BBC Scotland. "Another five minutes and we win the game. "We should get another penalty in the last minute when Carl Tremarco handballs it and, at the very least, we deserved a draw. "But, in the second half, the boys were relentless and I am delighted we got something from a game when it looked like we may not." Caley Thistle had taken the lead through Liam Polworth and looked like taking three points when Quinn was judged to have impeded Draper and Greg Tansey scored the resulting penalty. Hughes was proud of the effort his players put into the match but was frustrated that they could not close out the victory after being two goals up with 17 minutes left. "We respect Aberdeen as they are a wonderful side, so to come and make sure they had to work hard for a draw means all credit to my boys," he said. "I'm disappointed to lose a two-goal lead, but you have to give credit where it's due as it was all Aberdeen in the second half. "We should have seen it out and held on, but that has been the story of our season, although that is us unbeaten in the last three games." Hughes also lamented chances missed by their in-form striker. "We actually had the better chances and Miles Storey should have scored early on and done better in the second half," the manager added. "The first goal was self inflicted and the second was a penalty where Danny Devine is adamant that the ball hit him in the midriff, not the hand."